Are you planning to buy some eccentric furniture for your patio? If yes, we are here to guide you with the top four provocative patio furniture designs to add extra appeal to your deck or garden. This sectional sofa has been specially designed to add comfort and style to your outdoor living space. This sleek and stylish patio sofa set made of long-lasting and superior quality resin wicker gives your patio a traditional look with a naturally elegant appearance. The Piazza comes with cushions made of fade-resistant fabric. It includes a corner love-seat, armless love-seats, corner club chair and a coffee table. This semi-circular Rocking Bed Banana is a simple yet trendy couch that can easily add style to your patio thus creating a calm and comfortable atmosphere to curl up and take a nap. The natural color of rattan provides a graceful feel to your outdoor living space. 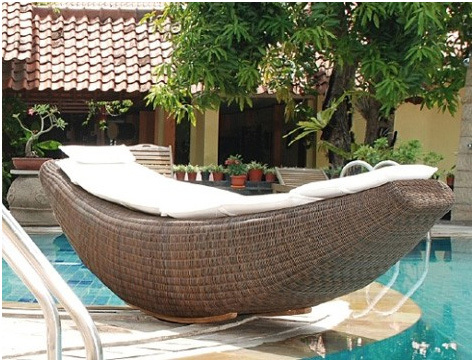 This cozy and comfortable outdoor lounger comes with a pillow that extends all along to support your body. Rocking Bed Banana is made of all weather-resistant materials and hence it is durable and lasts long even in extreme weather. This amazing sectional sofa by the Vienne Collection is apt for hosting vivacious patio soirees and family gatherings. This classy sectional sofa comes with canvas colored seat cushions made of fade-resistant fabric. 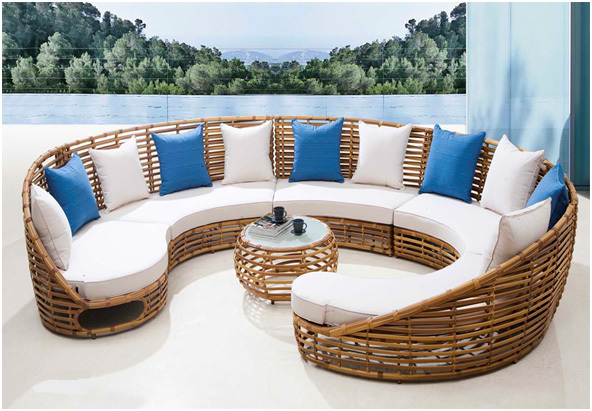 Each piece of this sectional sofa is made of a strong rustproof aluminum frame coated with weather proof resin wicker that makes it durable besides giving the furniture a modern and trendy look. This wicker furniture set is fully welded and properly woven for extra durability. The Sectional Outdoor Sofa by the Vienne Collection comes with two sofas, ottoman with cushions and a coffee table. This comfortable outdoor day bed made of long-lasting all-weather wicker, features a high-back with compact cushions made of fade-resistant fabric. Each piece of this gorgeous patio-bed has been made of durable and all welded aluminum frames. This exceptional patio bed has been aptly woven and specially designed to fit perfectly on your deck and porch irrespective of the size of your patio. For extra comfort, you can either drag the pieces of the furniture to get sufficient space or join them together to relax on this stylish day bed. The modern outdoor day-bed consists of two interlocking lounges, canvas natural and raven-black cushions along with a coffee table. Being made of natural element, it can be easily rinsed off with water and mild soap. Provide your patio with a fresh new look by adorning it with the best furniture designs of the season. Patio furniture is always a useful addition to your outdoor living space and remodeling your patio with new furniture occasionally gives your patio a vibrant look thereby providing you with a feeling of deep relaxation.